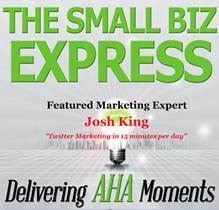 A few weeks ago, I was blessed to be the first guest interview on the podcast The Small Business Express. My friend Mike Monroe, along with Gary Shouldis, are packing the podcasts full of great information for small business owners. Definitely worth downloading, and the best part is that the podcasts are free. I feel very honored to have be interviewed by these two gentlemen. There are very few magic pills in marketing. Marketing your business, like anything else, comes with almost no guarantees. Social media is often viewed as a magic pill – a fix everything marketing solution that will magically bring in customers. Social sites like Facebook and Twitter have done a lot of good, and in some ways, leveraged the playing field for small businesses. Still, they aren’t guaranteed. Editor’s Note: This is a pretty heavy handed post from me, but what I describe here happens a lot and hurts a lot of small businesses. Having a social media account that you don’t update – or worse yet, that you don’t use anymore – is like locking up your business at the end of the day but leaving the open sign on. Unsuspecting customers walk to the doors expecting you to be open and find the doors are locked. You may not think it’s that serious, but nowadays, a large percentage of people are making decisions based on what they find online. Social media sites offer a daily temptation – the opportunity to call somebody out. Perhaps someone tweets a typo. If you manage a brand page, maybe a disgruntled customer wrongly accuses your company publicly. Or, maybe a friend posts an opinion that is just wrong (at least, according to you). Right or wrong, calling someone out on a social media site is rarely a good idea. Don’t believe me? Think of politicians. Do you applaud a candidate more when they openly and aggressively bash an opponent? Even if you are right, pointing out that someone else is wrong doesn’t elevate your position with followers. It doesn’t make you a leader. All it does is pick a fight, and poke the bear. I used to be a deal shopper. I’d spend hours researching the best deal, most likely only shopping online. I’d make a purchase from a nondescript online store. A few weeks later (I was too cheap to pay overnight shipping), my purchase would show up conveniently at my door. So, the idea is to take online relationships and move them to offline interactions. Putting faces to names, that sort of thing. There are several great, local tweetups in Spokane. #SpoCT, a coffee tweetup, and #SpoWT, a wine tweetup, to name a few. I started #Spokane #BeersUp for the simple reason that I like networking and I like beer. That doesn’t make me a drunk or anything, just like enjoying soda doesn’t make someone a glutton. Anyway, a new friend, John, wrote a blog about #Spokane #BeersUp that you should check out. That is all.